My name is Anu. I was born in Nayanagar, Dharavi slum neighborhood, Mahim, Mumbai. I am the first generation from my family to go to school. I lost my father in 2013 in a road accident when I was 12 years old. My mother works as a domestic helper. There are many girls in our neighborhood who face a lot of hardships and problems like domestic violence, abuse, “eve teasing” (sexual harassment), child marriage, etc. This neighborhood is one of the most notorious pockets of the slum where drug abuse, domestic violence, child abuse, child marriage etc. is very frequent. We didn’t have dreams and aspirations until the Slum Innovation Project started in our neighborhood. 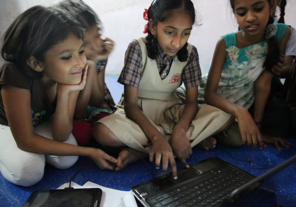 In January, 2014, the Slum Innovation Project was started in Nayanagar, Dharavi slum neighborhood, Mahim, Mumbai by Nawneet Ranjan who uses Story and Technology to empower girls and women to become Change Makers. 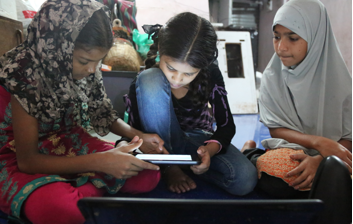 Anu, Roshani, Sapna, Mahek, Rani, Fauziya, Zaberi, Deepali, Savita, Rani and many more joined Slum Innovation Project where they were introduced to the role of stories in personal narrative and how using technology can make a paradigm shift and also challenge the status quo. Mr. Nawneet introduced us to this STEAM (Science, Technology, Engineering, Arts & Mathematics) Program in our neighborhood. Slowly we started to learn computer science and coding. We were introduced to the MIT App Inventor platform. We attended a Leadership and Technology for Social Good workshop. Under Mr. Nawneet’s mentorship, we made a list of problems in our community and decided to work in separate groups on the MIT App Inventor platform to create our mobile applications to solve community problems. In 2015, we published our first mobile app, Women Fight Back, on the Google Play store. We are engaging our community to use this app to address the problem of women’s security. It has started to help our sisters and mothers. Slowly, the amount of eve teasing and domestic violence is decreasing. We will keep working to reach out to more people from the different communities to solve the problem of violence against women, girls and children. We have made prototypes of apps that address the problems of water collection, girls’ education, community cleanliness, child labour, etc. We are working on these prototypes now to make them work better and eventually publish them in the Google Play store. 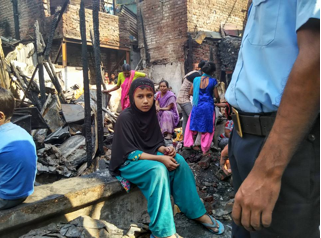 In January, 2016 there was a fire in our neighborhood and many of the girls lost everything. We are reaching out through our crowd funding campaign to get the materials we need to rebuild our lives and continue to pursue our dreams of using technology to better our communities. It will be great if you could share and spread the word about our campaign. We have already raised 75 percent of our goal. Help us to reach our goal and realize our potential. Let’s together make this Story of Change successful.